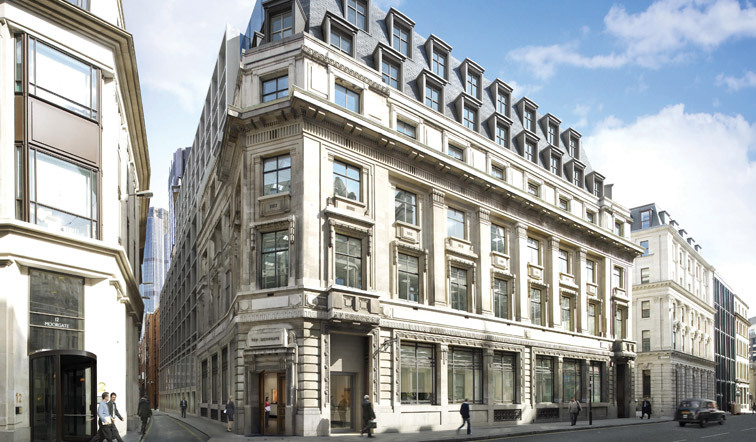 8 Moorgate is a £40m commercial office development in the heart of the City of London for Mitsui Fudisan and Stanhope. The development is set in the Bank Conservation Area, delivering 120,000ft2 of commercial office accommodation over 8 storeys. The project achieved BREEAM excellent. The project involved the demolition of six existing buildings on the site and replacement with an eight storey high specification commercial office building with a single basement across the site. The building’s historic façades were retained during the construction works and incorporated into the new scheme along Moorgate and sections of Telegraph Street, Kings Arms Yard and Token House Yard. A Grade II listed building neighbours the site on the north-eastern corner of the development and remained occupied throughout the works. In considering the building’s structural design, our team were faced with several challenges posed by complex sub-ground site conditions including extensive Roman Archaeology across the site, a high risk of unexploded ordinance from the Second World War, LUL tunnels in the street in front of the site and the Walbrook River channel running across the rear half of the site (one of London’s ‘lost’ subterranean rivers). These challenges required close coordination to enable archaeological excavation and piling to progress efficiently and safely across the project. The use of three-dimensional structural models and collaborative working with the contractor from an early stage also assisted in producing an efficient phasing of the works to minimise the programme impact of these constraints. This coordination resulted in an imaginative use of combined permanent/temporary works solutions such as an annulus arrangements of mini piles to provide both archaeological shafts and permanent bearing piles in the final scheme. As part of the building services commission our team also advised on the energy strategy, the façade performance to meet Part L2A 2010 requirements and the reduction of carbon emissions. The building’s sustainable measures include a new modern lining behind the existing building fabric, a combined heat and power unit and high efficiency chillers. The building achieved a BREEAM ‘Excellent’ rating. The scheme is considered to embrace cutting edge design including items such as the newly developed air diffusers which were proposed by Waterman and are now the client’s preferred system on all new projects. The development was designed in AutoCAD 3D and Revit enabling the 3D models to be passed on to the contractors to form the base of their installation drawing process. This project won the BCIA temporary works award in 2014.